Learn how to create the perfect Princess Belle bedroom for your little girl. Delve into the magic of Disney to make your daughter's favorite fairytale come to life just for her. A magical bedroom featuring her favorite princess will surely stop any 'time for bed arguments' don't you think?! Belle from Beauty and the Beast is one of the classic Disney Princesses that often appear along side other friends on Disney Princess beds, furniture and collectibles, but sometimes she likes to be on her own. If your little cherub loves Belle then you could design them a Disney Princess Bedroom that is totally Belle inspired – a Disney Princess Belle Bedroom. Let’s see how you can achieve a real Beauty and the Beast effect in your little girl’s bedroom from floor to ceiling. 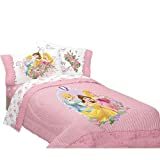 For the bed you can use a number of different Disney Princess bedding combinations as a lot of them feature Belle although I think that this comforter is possibly the best choice (I've also included a sheet set for you too) –. An integral part of any little girls Disney Princess bedroom is the bedding. Disney Princess bedding will make every little girl feel special. Close your eyes and imagine her delight at finding her bed covered in Disney Princess bedding, she will be so happy her face will light up in joy. This is just one easy way to make your little girl feel like she really is a princess! Why? Because it’s set in a rose garden of course and we all know that Belle and roses go together. Slip these Snugglers onto any ordinary pillow to create a cuddly, plush pillow companion. On the walls you can add some Belle posters, you’ll find some great ones at the Disney Princess Poster Store. Also a fathead sticker would look fantastic. If you have room it’s always great to have a standup in the corner, of course sometimes it’s not practical. It’s a great idea to keep in mind for princess parties as well though. Often overlooked on walls are switchplates, but updating them with a Beauty and the Beast plate is really like adding the finishing touches to a Princess Belle bedroom. There aren't as many bedroom ideas for Belle as there are for some of her other Disney Princess friends, but combine the ideas I've mentioned with a few finishing touches (see below) and your daughter will simply adore her own little magical kingdom. To add a finishing touch of Belle magic to a bedroom there are a few things you can do such as putting a plush beast on the bed! Choosing a Belle nesting doll, snowglobe and jewelry boxes are other ideas that will help add a finishing touch to a Disney Princess Belle bedroom. Imagine combining the magic of snow globes with the fantasy of the Disney Princesses. Well imagine no more because I have a collection of Disney Princess Snow Globes here for you to peruse. These beautiful snow globes are the perfect gift for a little girl who dreams of becoming a princess. The Disney Princess nesting dolls are a great combination for any little princess to own however. As a toy and a bedroom ornament any one of these Disney Princess nesting dolls are sure to be a hit. See Disney Princess Belle with Her Other Disney Princesses! Girl's Bedrooms Aren't Just About Beauty and the Beast!